It’s time! I’ve spent a couple hours learning the basics of balance and stability and safety on the forklift, been intimidated (initially) by the math, and passed all the on-line tests with (if I say so myself) flying colors. Now, the rubber hits the road, as they say. It’s time for me to show up at Atlantic Forklift Services warehouse and take my practical test- hands on a forklift! I would be working with Matt Cox from Atlantic Forklift, who knows more about forklifts than just about anyone else. My practical exam would take place on a Doosan Pro5 truck- not a huge forklift that might overwhelm a first-timer- this felt like a good truck on which to get my feet wet. The Pro5 is a diesel-powered unit capable of lifting about 8,000 pounds- far more than I would be lifting during this test. The first thing, as we’ve discussed here before, is the pre-shift inspection. A lap around the forklift that confirms everything is working and that there are no obstructions in the wheel wells or masts. This takes several minutes if performed correctly and heightens the anticipation of actually getting on the forklift. The first thing you learn when it is time to get on, is that there is a technique to climbing on board. There are handles you should use to make getting into the truck easier. After buckling in I familiarized myself with the handles and pedals and…. hold on. There’s an extra pedal. I expected two. I got three. Acceleration on the right, brake in the middle. What’s the third pedal, on the far left? That, I learned, is called the “inching pedal.” It gives the forklift just a little bit of power to “inch” closer to the load you’re going to move when finesse matters more than power. It takes some getting used to. I got to practice moving the forks up and down, side to side, and tilted the mast back and forth. I drove the forklift in forward and reverse, of course sounding the horn before I moved backwards even though the “reverse siren” worked just fine. Truthfully, I just wanted to blow the horn. Moving a load proved challenging but not as hard as I thought it might be. I took a small load from a shelf to the floor, and back. The only significant mistake I made was when I stopped the forklift to dismount for a moment, I neglected to lower the forks to the floor- a safety procedure that really should take place any time you leave the lift. There’s more to it than this, but I don’t want to give away all the secrets. Overall, the process is intimidating at first, but not overwhelming. I’m now qualified to drive a Class 4 or 5 forklift and if I need a career change, I have options! 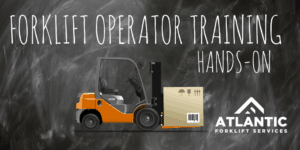 If you think driving a forklift might be for you, there’s no one better in the business than our professionals at Atlantic Forklift Services. Contact us and we’ll get you started.